CNN Senior White House Correspondent Jim Acosta clashed with White House Senior Adviser Stephen Miller at the press briefing Wednesday over President Donald Trump's support for legislation that would curb the level of legal immigration to the United States by instituting a skills-based immigration system. Invoking the famous poem inscribed in the base of Statue of Liberty which beckons the world's "tired ... poor ... huddled masses yearning to breathe free" to America's shores, Acosta asked Miller if the White House was "trying to change what it means to be an immigrant coming into this country." "It doesn't say anything about speaking English," pressed Acosta. "[A]ren't you trying to change what it means to be an immigrant coming into this country if you are telling them they have to speak English?" Miller argued that speaking English is already a requirement for people seeking to become naturalized Americans, and dismissed Acosta's citation of the words on the Statue of Liberty, saying they were a later addition to the statue. "The Statue of Liberty ... is a symbol of American liberty lighting the world," said Miller. "The poem that you are referring to was added later and is not part of the original Statue of Liberty." 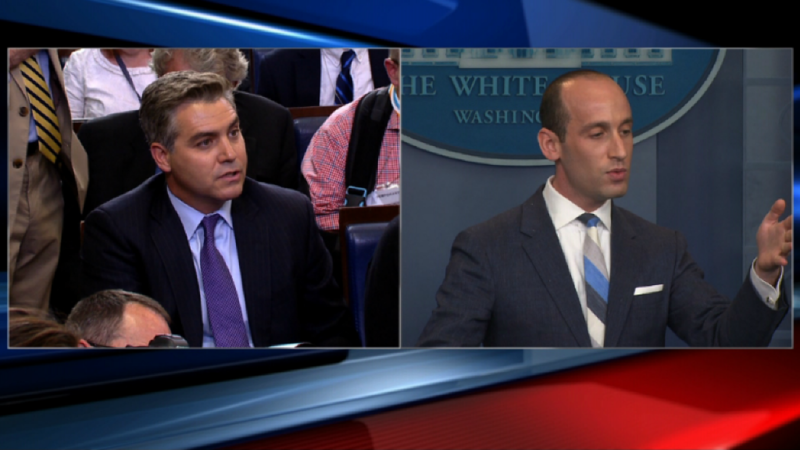 Miller went on to ask Acosta just how many legal immigrants per year would satisfy a so-called "Statue of Liberty law of the land." "Tell me what years meet Jim Acosta's definition of the Statue of Liberty poem law of the land?" he asked. But Acosta, who is the son of a Cuban immigrant, argued back that by limiting entry to people who already speak English, the law could prioritize people from English speaking countries, a point which was seized upon by Miller. "It sounds like you are trying to engineer the racial and ethnic flow of people into this country," said Acosta. "I have to honestly say, I am shocked at your statement that you think that only people from Great Britain and Australia would know English," Miller replied. "It reveals your cosmopolitan bias to a shocking degree ... This is an amazing moment." "That is one of the most outrageous, insulting, ignorant and foolish things you've ever said," Miller added later. The exchange eventually simmered down and Miller issued a rare apology from the White House Briefing room dais. "I apologize, Jim, if things got heated, but you did make some pretty rough insinuations," Miller said before handing the podium off to White House Press Secretary Sarah Huckabee Sanders. In a speech at the White House earlier Wednesday, Trump backed The Raise Act, legislation proposed by Republican Sens. David Perdue and Tom Cotton. The bill faces long odds in Congress. Top White House aides have been working with Perdue and Cotton on the bill, which if passed would dramatically remake the current immigration system. "It has not been fair to our people, to our citizens, to our workers," Trump said of the current immigration system, specifically citing low-income and minority workers.